Welcome to the first PSERN News issue of the Year! Radio Towers on Ring Hill. As we move forward into a brand new year, we are already off to a very busy start! 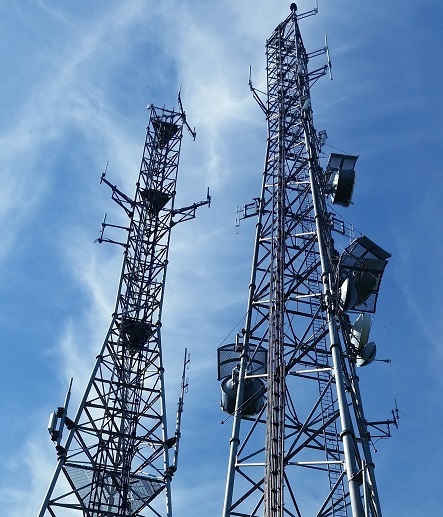 Our system vendor Motorola Solutions Inc. is continuing work on the final system design and the project has reviewed the first of many deliverables and provided feedback on needed changes. Site development activities are ongoing but progressing a little slower than we planned. We are confident that we can make the time up and not affect the project duration. In part because of our progress and in part because our original project schedule was not as detailed as it should have been, we feel it’s necessary to re-write the schedule and develop a more detailed and realistic schedule that is also integrated with our vendors. In addition, we are taking a look at our key project documentation and making sure that our process is constantly updated and in line with where we are in the project. We have also been working with our PSERN Taskforce to ensure first responders have the equipment they need to keep our region safe. They have helped us with tasks such as choosing features for the new radios that first responders will use with the new network, how first responders will be trained for the new network and how users of the network will participate in testing. As you can imagine a project this size has a lot of moving parts in a lot of different areas so we recently hired additional staff including a 2 project managers, an additional construction manager and a master scheduler (who is a consultant). Moving forward the project team will continue to grow but there will also be additional opportunities created through our vendors for potential jobs throughout the County. I am very excited to see significant progress already in just a few weeks of the New Year on the project and I am looking forward to making great strides in 2016. Meet the PSERN project's newest members! Dave has been with King County in the Project Management Office (PMO) as a King County Information Technology (KCIT) PM II for almost 5 years. While at KCIT, he has worked as the PM on three IT projects—I-NET II, 2 Factor Authentication, and Unified Communications. Prior to coming to King County, Dave served 14 years at Washington State, primarily in Telecom/Network Control filling roles from Engineer, Architect, PM, and Supervisor. In addition, he previously worked on projects for Microsoft and Washington State Department of Licensing. Before that he cut his “IT teeth” in Telecom/Network Control in the banking industry for 15 years, back when mainframes took up half a city block! Dijana A. Steward joins the PSERN Project Management team after spending the last year working as a Project Manager/ Deployment Lead for the King County Unified Communications project. A transplant from her native Southern California (LA and Palm Springs) to Seattle, Dijana spent the majority of her 10 year career managing projects in Healthcare IT. Outside of work, Dijana’s world completely revolves around her family. She is passionate about empowering girls to become strong women, Autism Awareness and exploring new foods alongside her partner Larry. 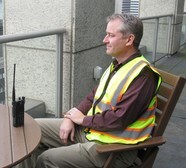 Robert Gruhn has been in the wireless communications industry for over 20 years. He has managed the deployment of radio networks in cellular, wireless in the local loop, land mobile, and emergency response networks. In addition, Bob worked for both major carriers such as AT&T and Sprint and vendors such as WesTower and Motorola covering every aspect of the site deployment life-cycle. Most recently, Robert joins the PSERN team from California where he deployed metro-area microwave networks for Internet Service Providers. Officer Squelch hails from Plantation, Florida just as her colleague Mic did. She brings a wealth of experience as a previous mascot for Pretty Girl Cosmetics and LUGGS shoes. Officer Squelch decided she wanted to pursue something more serious that would help the community so she decided to go into law enforcement as a public relations manager. Her friend Mic told her about the position with PSERN and she jumped at the chance to join the team! 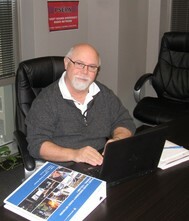 Bill has over 30 years experience in project management and QA consulting. He brings a wealth of experience and owns a Project Management and Quality Assurance Consulting firm in Olympia, WA. He joins the PSERN team as a consultant and Master Scheduler for the project. Before joining the PSERN team, Bill worked on the KCIT Mainframe Rehost Project, initially as a project scheduler but his experience led him to move into business analysis and helped KCIT complete the last phase of the project on schedule. When he isn't making the trek from Olympia to downtown Seattle, he enjoys golf, skiing, boating, and the company of friends. He is also a recent cancer survivor (August 2015) and is now really trying to enjoy life to the fullest! 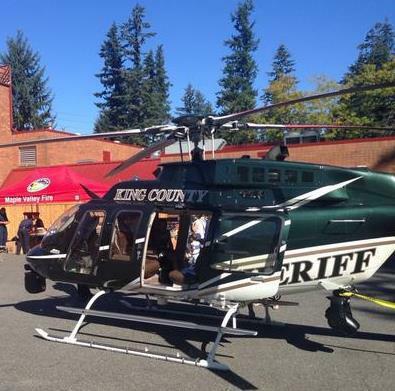 King County Sheriff helicopter ready for action. A project of this magnitude has several agencies and partners that we are working with at any given time. You may not realize it but there are a lot of steps we have to go through to get to the final step of actually building a radio tower. Many of the tasks involved in a project this size can take a significant amount of time--identifying a potential site, checking it for viability, testing, obtaining leases, getting leases approved, developing zoning drawings--and these are just a few important tasks. In addition to those listed above, we will be working with many others to obtain building permits and conform to land use. When looking at potential sites we want to make sure that harm will not come to natural resources so we have several great agencies that we partner with in order to do environmental reviews and obtain the permitting we need to move forward. 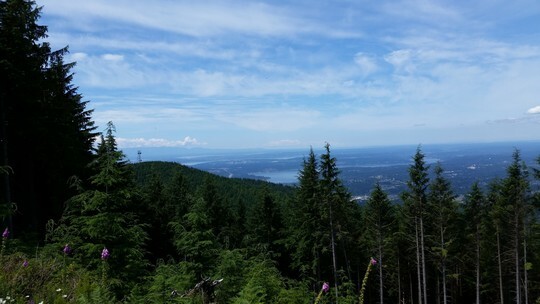 A view of natural resources from the West Tiger Mountain site. Docs Docs and More Docs! 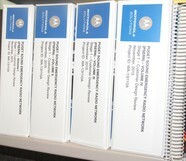 As we mentioned in the past, the system vendor Motorola Solutions Inc. has several deliverables they provide to us. These documents include items such as diagrams, networking plans, microwave paths, site layouts and much more! To give you an idea of the magnitude of information shared, the binders you see here are only the first set of many more volumes to come! 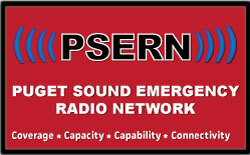 The PSERN Web Site received face lift for the new year! Learn about the project, governance, project partners and get the 411 on the project from Mic's blog! Check it out! Did you know that before actual construction begins at a site, the soil must first be tested? Once the soil is tested and approved then we know what kind of foundation is required. But we aren't done yet! After laying the concrete for the foundation, a sample of it must be sent to a "test lab" to see if it has the strength to hold a massive tower. The pic to the right is soil from Grass Mountain the first site to be tested! Firefighter Mic and Officer Squelch meet with project manager Dijana to discuss outreach strategies for first responders. We still have some PSERN items left but they are going fast! If you would like to receive some swag for your department follow us on Twitter @radiomatters and we will drop some in the mail to you!